The finance department of the Seventh-day Adventist Church in Canada made a happy announcement at the start of 2011 as it revealed that tithe-giving among its members increased by 2.66% in 2010. 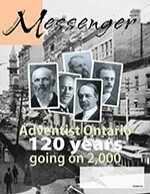 In real dollar figures, this means that Seventh-day Adventists in Canada contributed $63,798,384 in 2010 as compared to $62,142,997 in 2009. Leading the way in the increase is the Québec conference, whose members gave 5.34% more in 2010 than in the preceding year. In second place is the small mission conference of Newfoundland and Labrador. The folks in our easternmost conference increased their giving by 5.07%. None of the seven conferences in the Seventh-day Adventist church in Canada showed a decrease for the year.